Thumbtack unveiled its moving cost calculator last week to help residents price their move. The service is available for free on Thumbtack's website. Other services offered on the platform include a checklist to better organize your move. One of the few things worse than moving is being asked by a friend to help them move. You can’t say no, at least not if you’re a true friend. But something you can do is recommend they try Thumbtack’s new trip calculator, so they can see how much they should be paying you for helping them, or how affordable it is to hire actual movers. Thumbtack unveiled its moving cost calculator last week to help residents price their move. The service, which is available for free on Thumbtack’s website, is as streamlined as you’d hope your move would be. 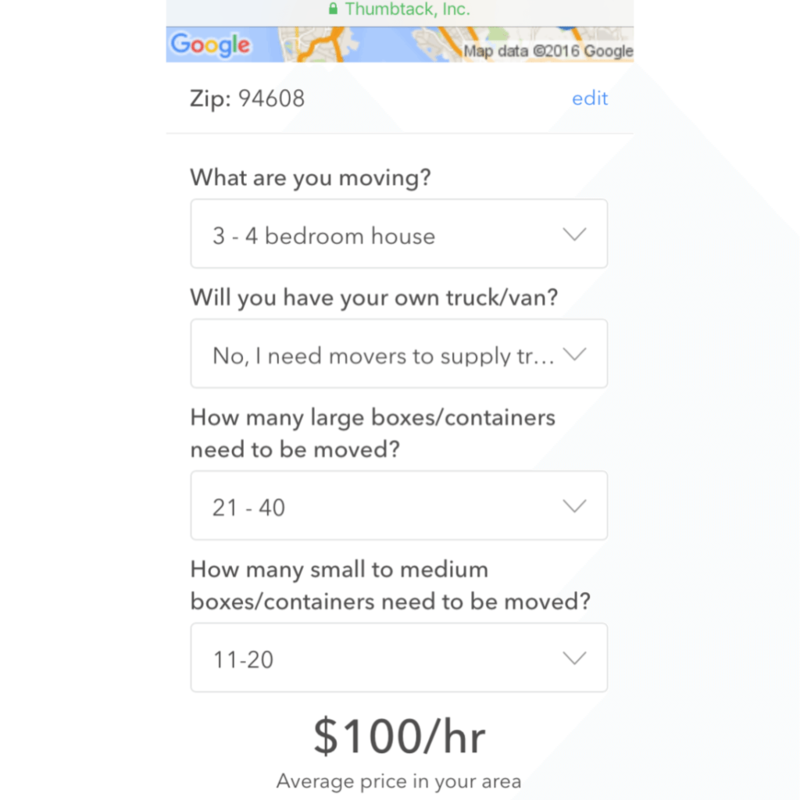 Thumbtack unveiled its moving cost calculator to help residents price their move. Simple questions about the size of your apartment or house, a rough estimate of how many large and small boxes, and whether or not you need a van is all the information Thumbtack needs to send you a quote from a local moving service. After you answer these questions, a prompt opens to answer a few more, but it also requests information about how many flights of stairs and the distance of your move. It also asks if you have large furniture (pianos, shark tanks, pool tables, etc.). Quotes are sent via email or text message within 24 hours. Other services offered on the platform include a checklist to better organize your move. One of the main things to remember, though, is to always discuss and confirm your pricing with your mover before any work is done. Thumbtack stresses some helpful tips at the bottom about the final stages of the moving process. Some of these seem like common sense, but you don’t want to overlook things like cancelling your utilities, labeling boxes, and hiring a cleaner for your home so it’s spotless for the next residents.